Welcome to our Penguin product-related section. Here, you'll find customer questions we have received, and relevant answers we have shared with those customers in regards to using their Penguin products with our EasyStart™ product line. If you don't find the answers you need here, please feel free to contact us directly. 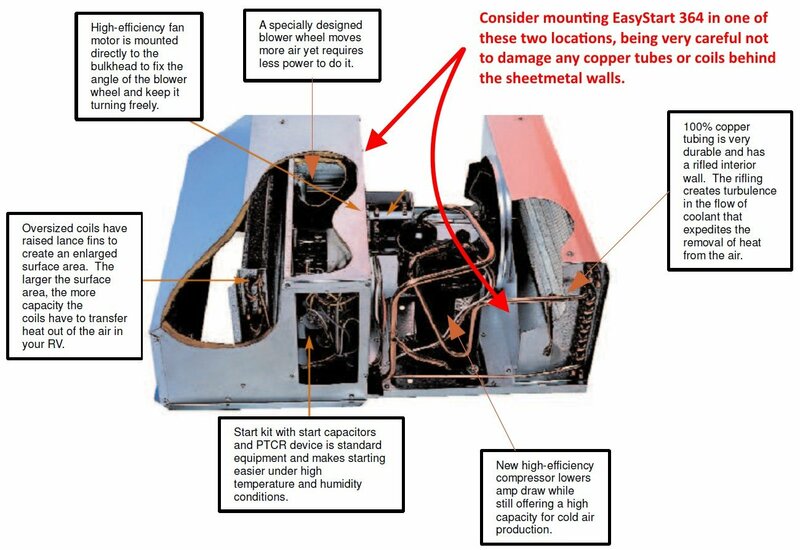 I have a Dometic Model Duo-therm Penquin Air Conditioner unit atop an 2008 Airstream Safari and would like detailed installation instructions for the Easystart please. The original Duo-Therm Dometic Penguin (I) had several different wiring diagrams, and over the past year we've generated a number of them for various customers. Here's a link with all of them. One of them should match up with your unit. If not, please let us know. I need to install an Easystart Model 364 on Dometic/Penguin II. Please share the wiring diagrams. Please find all wiring diagrams here. Also check if either of these relate to your product specifically. If you still need help, please take a photo of the wiring diagram for your system and send it to us here. We will draw in where the EasyStart goes and send it back to you. I recently purchased your EasyStart 364 Soft Starter for my 2006 Bigfoot Camper AC. Can you provide me an installation guide for a Dometic Penguin model 600312.331C? The edometic.com website indicates that your Dometic Penguin model 600312.331C is the original design, likely original equipment on your 2006 trailer. We have found from our customers that these models come with a few different wiring diagrams. 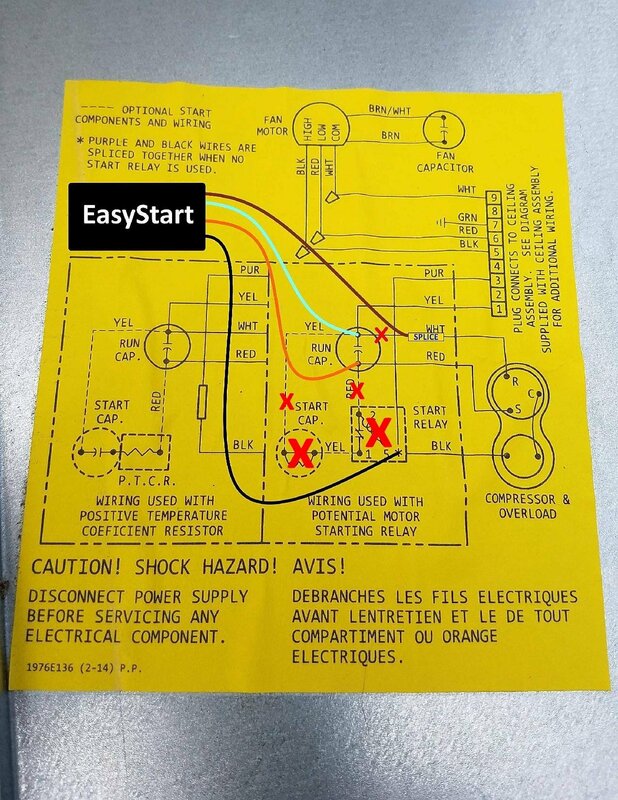 Attached are those wiring diagrams with the EasyStart 364 built in. On all original Penguin I designs, we have found that the best place to mount the EasyStart is on the inside of the condenser air box, on the wall facing the compressor. It just fits in that spot and can be secured with 3M double-stick foam tape and maybe a self-tapping screw or two. Be careful not to run any screws into the cap tubes on the opposite side of the wall (at the top). I have a xantrax pure sine wave prowatt 2000 watt inverter. Will I be able to run a Dometic Penguin 15000 BTU rooftop air conitioner using the Micro Air Easy Start? So you should be able to also start and run it on the Xantrex ProSine 2000 inverter as well. Please realize that certain 15kBTU A/Cs could consume upwards to 95% of your inverter's 2000W capacity in hot weather, so one must power manage the other auxiliary loads appropriately. I have a Mach 1 Model#48207C966. Where would be the best place to install the Easy Start 364? Any information you could provide for my specific model would be a big help. I am not real technical,but I would like to do this myself. If you feel that you are not technical enough, you may want to consider having a professional install the EasyStart. We would highly recommend that to avoid damage to anything. The Coleman model you cited corresponds to the 11k Coleman Mach 1 PS (power saver). Attached is the EasyStart wiring diagram we previously made for this model (or one very similar). Also attached is a photo of some suggested mounting locations. Since the EasyStart 364 X20 IP is too large to fit inside the electric box of the Coleman high-profile units such as yours, it has to be mounted outside. It is weatherproof, so there is no problem with that. The wires still need to be routed back inside the electric box though to accomplish all of the connections.